The leading developers of animated characters for Microsoft Agent technologies since 1999, offering the largest selection and the most realistic MS Agent characters available, anywhere! 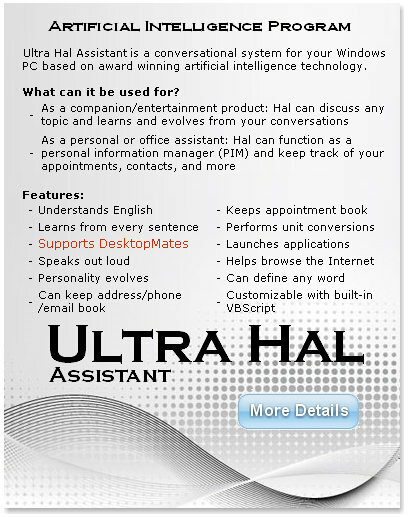 DesktopMates are animated human like characters that live on your desktop as your personal interactive companion & assistant capable of speech & doing tasks for you using Microsoft® Agent & Artificial Intelligence Technologies. 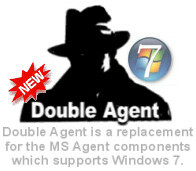 All versions of Windows 2000, Me, XP and Vista already comes with the core components for MSAgent Technology as part of your windows operating system. IMPORTANT: DesktopMates characters ARE NOT stand alone programs that function by themselves. If you are a "New User" and not already using this technology, please go to the "New User Start Up Instructions Page" by clicking the "Free Starter Package Box" below and get up and running first before purchasing any DesktopMates characters. 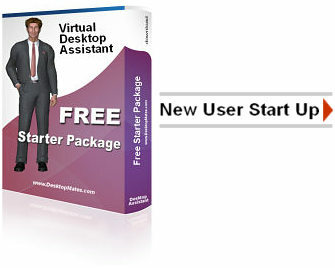 The New User Start Up software and components required to operate DesktopMates characters are fully functional and FREE! Once your up and running and familiar with how it works, stop back and check out the great lineup of DesktopMates character models available. Choose from an extensive showcase of characters including Office Assistants, fantasy & theme characters such as Androids, Wizards and Egyptians, and YES, we also have adult oriented models as well. Along with the free software & components available, any character models you purchase are yours to keep and use. NO monthly fees or re-billing charges EVER! Yes! our characters can speak your language. Check our downloads for speech engines available in your language.